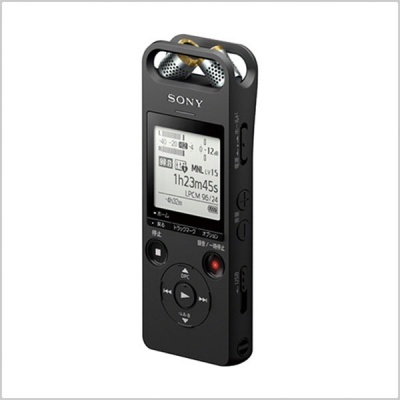 Authentic recordings with 3-way microphone: Capture band sessions in faithful High-Resolution Audio. Record crystal clear conversations and business meetings. 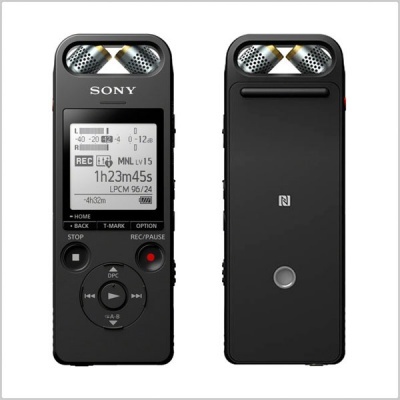 With adjustable microphones, this digital recorder reproduces every detail precisely. The Way The Artists Truly Intended: Enjoy the subtlest nuances of studio-quality sound in higher than CD quality with High-Resolution Audio. Passion for music unites every component from signal to speaker so it feels like the artist is performing right in front of you. Supreme sound, superior recording: Record and play with absolute precision. Capture songs and sessions in better than CD sound quality and enjoy everything you've recorded in High-Resolution Audio. 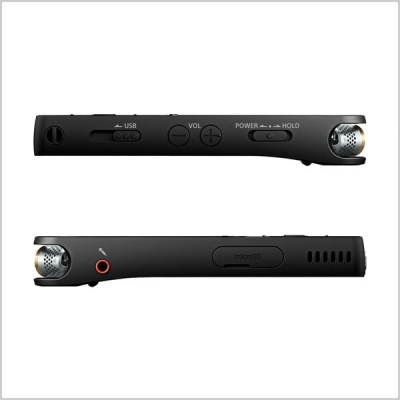 Linear PCM Recording: Capture sound at up to 96KHz/24-bit, a serious step up from the 44.1KHz frequency and 16-bit rate of CD. Free Lossless Audio Codec: Enjoy lossless audio with the clarity and dynamics that the artist intended, with flac playback support. Authentic amplification: The S-Master™ HX digital amp cuts distortion and noise across a wide range of frequencies. Enjoy jaw-dropping sound quality: Like going from standard definition to HD video, High-Resolution Audio tracks are far higher quality than MP3s and even CDs, letting you hear every breath, every drumbeat, every note. Even better, the S-Master HX™ all-digital amplifier reduces potential distortion, ensuring you always get the full listening experience recorded in the studio. Fine-tune recordings with a 3-way adjustable microphone: Whether you’re recording a business meeting, band practice, or an event outdoors, sound is always optimised. The adjustable microphone can be angled any of three ways to match your environment and capture music or voices perfectly, and can even record in the fine detail of High-Resolution Audio. Zoom for business: For small groups of people, such as business meetings or tutorials, the zoom setting captures conversations with optimum clarity so you’ll miss nothing. 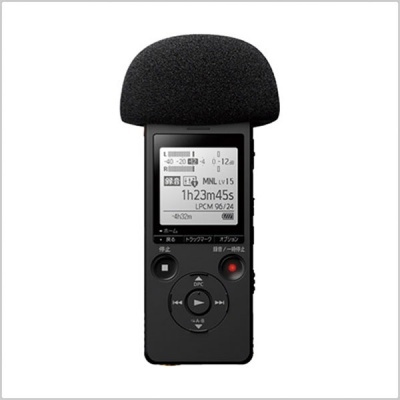 XY for music: For solo performances or small band sessions, choose the XY setting with performers close to the microphone for natural sound and depth. 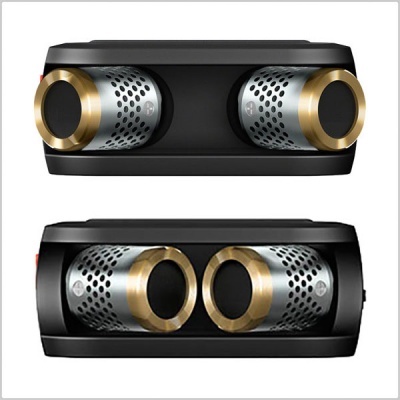 Wide stereo for outdoors: For open spaces, outdoor events and conferences, the wide stereo setting captures a variety of different sounds, giving a sense of realism and spaciousness. Easy smartphone control with REC Remote: Start and stop recordings, adjust levels and settings, and even add track marks, all using your smartphone. The REC Remote app, available on Google Play for Android or the App Store for iOS devices, lets you control your recorder from a distance over Bluetooth®. 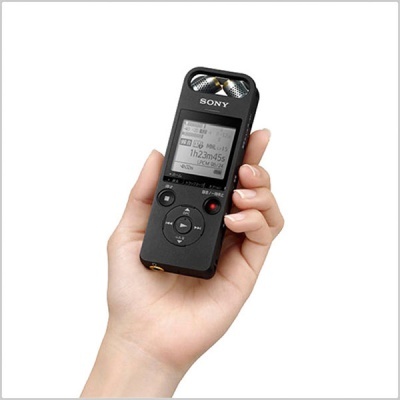 Take control: Use the app's simple control pad to start, stop and pause recordings, up to 10m (30ft) away from the recorder. Be informed: Set and check a variety of settings remotely, including recording mode and level, format, and bit-rate to get just the right sound. Stay organised: Press the T-MARK button during recording, playback or pause to add up to 98 track marks, making it easy to find content quickly. Boost your storage: With 16GB of built-in memory, you can record up to 636 hours of MP3 in LP mode. If you need more space, add a Micro SDHC or MicroSDXC card using the MicroSD slot. Plug and play: Don't waste time with cables. USB Direct lets you plug your voice recorder straight into a PC for easy transfer and storage of your recordings. Box Dimensions (LxWxH) 6.3 x 4.5 x 2.7"